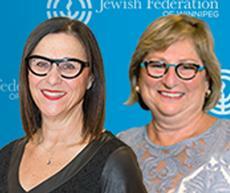 In the last year, the Jewish Federation of Winnipeg has accomplished a great deal and moved forward on a diverse and far-reaching set of goals. As the representative body of the Winnipeg Jewish Community, it is our mission to build and maintain a strong, secure and connected community rooted in Jewish values. As such, we reach out to strengthen our relationships with our partner agencies and all Jewish community organizations, as well as continuing to enhance our relationship with Winnipeg, Canadian and International organizations. As part of the Federation’s 80 years within the community, we re-launched the Federation’s Leave More Than Memories endowment campaign with the 80 for 80 challenge. The Jewish Federation and the Jewish Foundation of Manitoba work closely together to ensure that we sustain the campaign in perpetuity. We are very pleased that our fund is close to $5 million, and this will help secure our future. In 2018, 11 people opened new funds and 71 people added to their existing funds, allowing us to exceed our goal of 80 donors. Volunteer committees work closely with the Jewish Federation staff to accomplish the annual goals, and we would like to highlight some of the valued accomplishments of some of the departments. Financial Development works all year long on corporate sponsorship, endowment growth, as well as the Combined Jewish Appeal Campaign. Funds from our endowment and the CJA Campaign are allocated to our partner agencies, which enables them to provide services within our community. On September 1, 2018, we launched 120 Days of IMPACT, which concluded on December 31. As of today, the 2018 campaign is at $5.6 million. Thank you to all canvassers and to our donors, who made this achievement possible. It's not too late to make an IMPACT! Donations received by March 31, 2019 will receive a 2019 tax receipt. The Allocations Committee met with each of our beneficiary agencies in April 2018. Each agency provided a comprehensive presentation to the committee, highlighting their successful outcomes, and their needs and goals for the coming year. We are very proud of the great work being done to meet the vital needs of our community. The Community Planning Committee is working on action plans for priorities identified during Community Conversations last year. In the spring and summer, several new subcommittees began to meet and move the community forward, setting goals in each area. In a response to the desire for more opportunities to form meaningful connections in Jewish spaces, the Shabbat Engagement and Welcoming Community Committees were formed to help create these opportunities and ensure that all who want to be connected are able to do so. The Jewish Education Review and Innovative Programming Committees developed a program survey to gather information about Jewish programs and education opportunities, with a focus on what demographics they are meant to serve, potential barriers to participation, and participation rates as a measure of success. PJ Library sends books to 840 subscribers, and there is currently a waitlist of children who would like to receive monthly books. The program has seen a steady increase in community event partnerships with synagogues and partner agencies. Federation subsidizes each individual subscription by U.S. $50 per child per year. The Finance Committee has worked diligently to stay on budget and has set policies and procedures ensuring the Federation is on strong financial footing. GrowWinnipeg continues to have a positive impact on our community. Newcomers continually give back to our community as volunteers on committees, boards and as donors. More than 6,000 people have arrived in our city since we started to welcome people in our community through this initiative twenty years ago. Our newcomers have obtained gainful employment, and many are business owners. They are practitioners in a multitude of industries and disciplines, and their children have also integrated successfully into the community, holding jobs, and becoming volunteers in the Jewish community and general community. Israel and Overseas has seen a remarkable year. In May, we were proud to host the Joint Steering Committee Spring Meetings of Coast to Coast Partnership 2Gether – known as P2G. In addition, our local Gesher Chai (Living Bridge) program experienced significant growth in the past year. This year, March of the Living celebrated its 30th anniversary. In partnership with the CJA, we hosted Footprints: Celebrate the Past, March to the Future, an event that took place on October 10 with over 300 people in attendance. This event was followed by a special retrospective exhibit of the last 30 years at The Marion and Ed Vickar Jewish Museum of Western Canada. In April, seven students from Winnipeg participated on the March. The program has launched a “20 for 20 campaign” with the goal of having 20 Winnipeggers join the March in 2020.